There is a trick of making a place seem more remote than it actually is. This is almost always intentional these days, and in Suffolk we must be thankful for planning authorities with enlightened attitudes - well, mostly, anyway, and they have not always been so. And, my goodness, this place seems remote. You reach Washbrook just off of the busy roundabout where the A12 and A14 meet, and then climb away north from the pleasant little village, along secret doglegging lanes that become narrower and narrower. Hedgerows encroach, the roadway dips and rises dramatically, and it doesn't take much to imagine what it is like here in winter. Suddenly, you are directed up a muddy track by a little wooden sign, and down into an intensely rural bowl-shaped graveyard, a green sea of graves, within which St Mary is a ship, floating steadily. The wind ripples the trees, and rooks peel away over the ripening corn. We seem to be a very long way from anywhere at all. St Mary is in the care of the Churches Conservation Trust, and this apparent remoteness was one of the contributory causes of redundancy being declared in the 1990s. Matters had come to a head when the single figure congregation were presented with a six figure restoration bill - this church was declared redundant for the best of all possible reasons, although you can't help thinking that the state funding which parish churches in France have might have made a difference here. Ironically of course, the Church is already disestablished in France. Washbrook parishioners here must now go to the parish church at Copdock, which is actually closer to Washbrook village than this one. Washbrook and Copdock have been a joint civil and ecclesiastical parish for years, and they have shared a Vicar since the Reformation. As always, the CCT does a grand job here, maintaining this fascinating building, which retains much evidence of an interesting medieval liturgical life, as well as a good 19th century restoration. The restorer here was the great E. B. Lamb, and this is one of his three major works in Suffolk; the others were Leiston and Braiseworth. One of his legacies is the gorgeous red and black banding in the roof tiles. A Victorian porch on the south side, and what might be taken for a chapel (but isn't) to the north, enfold the 14th century tower. Unusually for a CCT church in Suffolk, St Mary is kept locked, and the keyholder is a good mile off at the top of a steep hill. If you are planning to come here on foot, it might be worthwhile enquiring about the key first. I was on my bike, and so I was soon back at St Mary, letting myself into the priest door in the chancel. I stepped into the devotional dimness of the tiny church. The chancel is something most unusual in predominantly Perpendicular East Anglia. It is a superb collegiate chancel in the Decorated style. Stalls line the walls, all in niches with charming little heads between them. They are recoloured as part of Lamb's restoration, but there is no reason to think it wasn't the original design. The 19th century glass beyond lends more drama than it takes away, and there is a simply beautiful Easter sepulchre in the north side of the sanctuary. The whole piece, both Decorated and Victorian, is breathtaking. Stepping down into the small, thoroughly Victorian nave, I stood for a moment in the cool dimness, the light from the south windows shafting across the nave into what becomes apparent as a baptistery. Lamb retained the medieval font and moved it into this little space, flanking it with angel glass to create the right atmosphere. Indeed, I think this is one of the best 19th Century restorations in the Ipswich area, retaining at once a sense of its rustic identity and the full self-confidence of the period. The best glass is on the north side of the nave, commemorating the death of Queen Victoria in 1901. The glass royal arms are probably the best of the period in Suffolk, and VR is picked out in the quarries as if it was a sacred monogram, which in away it was of course. There is another set of Victorian royal arms in plaster above the entrance to the baptistery. opposite, there is the sweetest little portrait of a baby in a Norman lancet. I also love the stained glass evangelists either side of the altar, and it is easy to imagine the Anglo-catholic tradition making itself at home here a century ago. No longer, of course. Ars Longa, Vita Brevis, I thought, and Sic Transit Gloria Mundi. I stepped outside into the gorgeous sunlight. A pair of chaffinches chased each other out of a bush, and I pottered about in the graveyard. At the time of Domesday, Washbrook was known as Great Belstead, the current Belstead parish being Little Belstead. The brook which give the parish its modern name flows a winding course to meet the Orwell at Bourne Bridge. Like all Suffolk's rural parishes, Washbrook must have been a busy place in Victorian times. One of the buildings you pass on your way through the lanes is the former school. 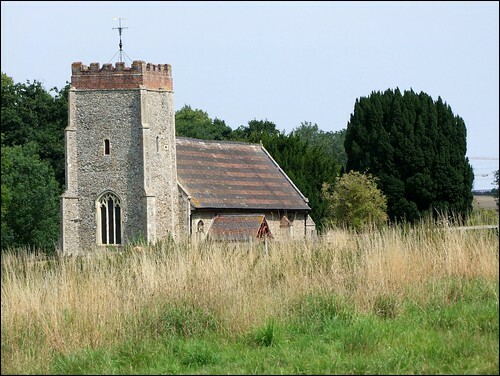 And going back further in time, Washbrook was big enough to maintain two parish churches before the Reformation, the other serving the parish of the hamlet of Felchurch, near to the Chattisham road. Hardly a trace of it survives. I suggested to you that the remoteness of this church was an illusion, and I am afraid that it is. Climbing up the ridge, the silence and birdsong are effaced by the increasing noise of traffic at the busy junction below. When I reached the top, I looked down. Not a quarter of a mile away, the Toys R Us and Tesco superstores shouldered each other at Copdock Mill interchange; an illuminated Pizza Hut hovered like a ufo above PC World, here where the A12 and A14 twist in a knot around each other. Beyond, the Chantry housing estate loomed, home to 30,000 people, and tall cranes building the new space age Suffolk One building, were busily turning. And then the centre of Ipswich beyond, not three miles from where I now stood. Not far short of a quarter of a million people could walk here within an hour, now. The tide is stemmed - but for how long?